Markstaar began working with This Old House many years to build your own fire pit. Do it yourself fire pits ranging in sizes from 30 inches to 56 inches. 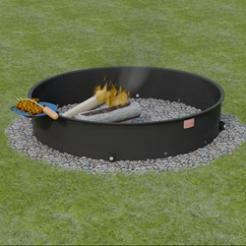 Markstaar and This Old House make it so easy to build your own home fire pit ring and fire ring of fire. When you need the fire barrier only, without the cooking grate. 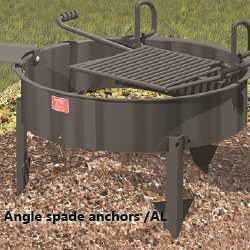 Our FX Series Campfire Rings provide a solid steel fire barrier, and do not include the cooking grate. 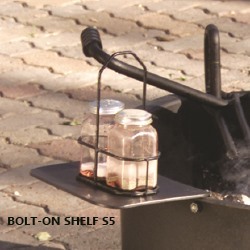 Perfect when you don’t plan to cook over the fire, but you need the barrier to control the fire, and protect the property or your landscape blocks. The FX Series steel ring is rolled from 3/16” thick steel plate with an integral formed 1” wide flange around the top edge. This flange provides extra strength against heat warpage and eliminates a vertical edge. Draft holes are provided for fire ventilation. 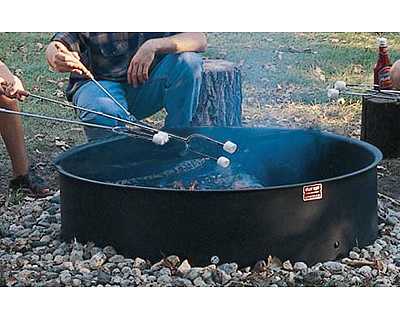 FX-48 Series Campfire Rings have a 46-inch inside diameter, a 48-inch outside diameter at the top flange, and come in three different side heights. Select the side height to achieve the degree of fire barrier needed. 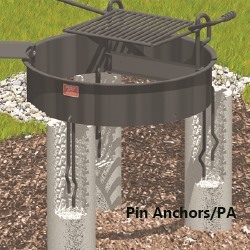 FX-48 Series firerings come with stationary pin anchors (/PA) that are embedded in concrete footings to secure the ring on the ground. OPTIONAL: Model S5 bolt on utility shelf.